Resident Evil 7: Biohazard is an upcoming survival horror video game developed and published by Capcom. The game is slated for release on Microsoft Windows, PlayStation 4 and Xbox One, with the PlayStation 4 version including full PlayStation VR support. The game will be the eleventh entry into the main Resident Evil series, and the first main series installment to be played from a first-person perspective. It will be released worldwide in January 2017.
Who's excited? Who's skeptical? We only have a few more months to wait. This will switch to the main game discussion thread a week before release. Honestly, I am probably checking out at this point. Maybe 3 years ago this could have seemed cool. But in a post PT (which probably had more creativity and narrative in one demo than this whole game will have, sadly) and post "1000000000000 indie first person horror games set in a creepy house" world, this just seems like it's going to be.... uninspiring? Same-y? It's been a weird journey to this point. I played and enjoyed 1-3 and 5, and the series definitely evolved into more a TPS than a survival horror, so I guess if you're looking for fear again, maybe this will float your boat, but all I feel when I watch the video is "wow, I've seen this 100 times before and all in like the past 24 months." RE6 and the spin offs were a bit of a mess, so I don't hold out much hope for this. I like that they're trying something different for the next game, but that different has already been flogged hard the last couple of years. Just HD remake RE2 & 3 for fucks sake already. I mean, we are getting an HD remake of RE2 at some point in the future which is nice as long as it's not episodic. This could be the game that makes me pick up a PlayStation VR. It also could be hot garbage, only time will tell. I am definitely waiting for reviews on this one. 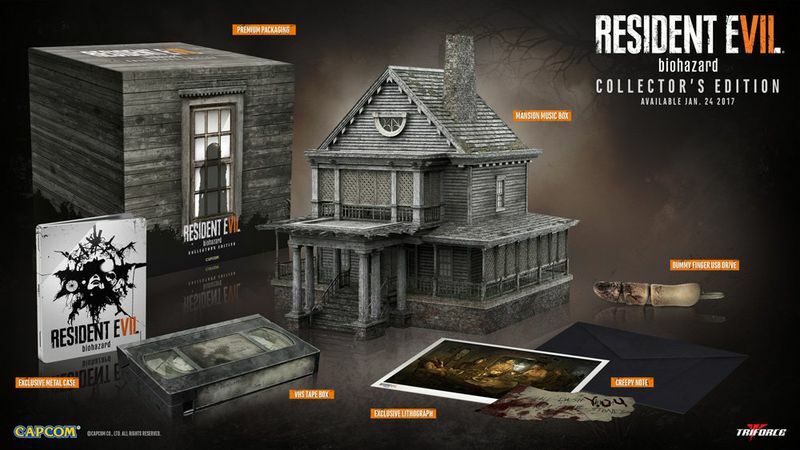 The $179 collector's edition comes with a tiny mansion. I'm not one for spending that much on one game. The only collector's edition I ever purchased was the Dark Souls II one. But hey, I'm sure some people are going to go nuts over this. Yeah I'm pretty much over limited editions and all that. I think the last Happy Meal edition I bought was Dead Space 2 with that lame gun. Just give me the game. Can't believe I didn't post the gameplay trailer. This still seems interesting! That said, I'm probably still waiting around on some reviews to drop before picking the game up. I was burned hard when I pre-ordered RE6 and paid full price on day one. I guess in some sense having a fully fledged AAA game making a game like this is ok, since most are indie/small-dev but LOL that voice acting of the enemies. It's like the worst stereotypical southern black dude. If anyone isn't dipping into the game until they see some reviews and what-not I'll probably be tossing my own review up on my site and cross-posting it here. This actually looks like the bee's knees. Also, do I spot some Regenerators in this footage? Here we go. 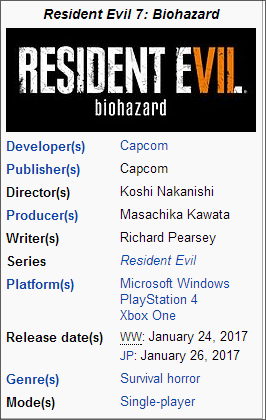 I'm still really curious about the game as a whole and how it'll connect with the previous Resident Evil titles as it's mentioned this takes place after the events of RE6. A new demo drops today for PS4 with us Xbox users getting the demo on Dec.9th. The more I see and hear the more excited I become. I almost pre-ordered today but bought Dead Rising 4 instead. We'll see what happens. A video i made about how zombies could be right n front of us, and no molded mutations are not zombies. Im not saying no zombies would destroy my hope in the game but i really hope they return. I've pre-ordered the game because the demo sold me. My thoughts shall be posted on January 24th. I would if I had a PS4, but no I'll be rocking on my Xbox. Still gonna post thoughts for some of y'all on the fence. I've been thinking of picking RE5 up for some couch co-op, definitely had a lot of fun with in years back. 6 was sort of a train wreck, but I'd be willing to give 7 a shot. I think I'll be waiting to hear some feedback from others who get it at launch and maybe wait for a price drop. I'll def post opinions though on the 24th since I do have it pre-ordered. Game looks very interesting so I put a pre-order in. Really looking forward to trying this out. Just got RE5, excited to start it tonight, it's been probably 6 years since I played it.